Earlier this year, around the time Expo West was going on (one day…I will get there! 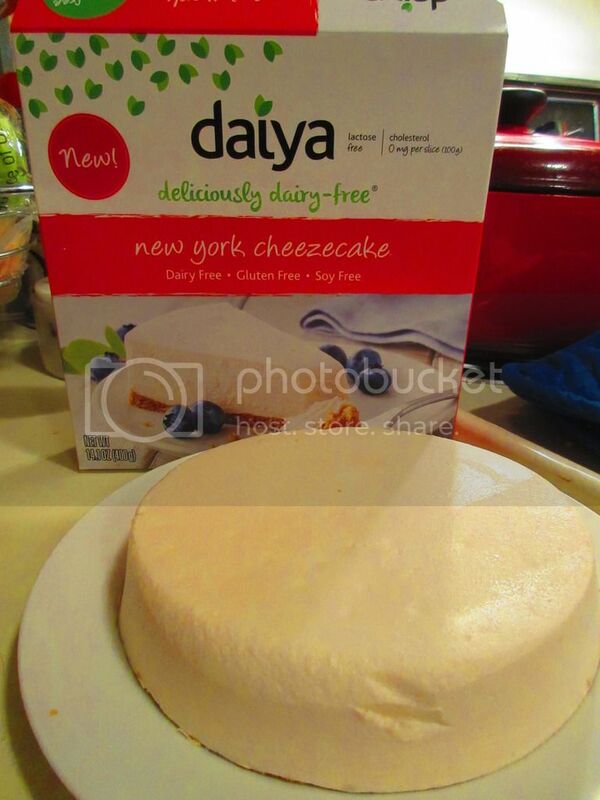 ), the leading name in vegan cheese products, Daiya, unveiled a line of cheesecakes. For those of you unfamiliar with the sheer awesomeness of Daiya, let me tell you about my love affair with their products. Daiya is a household name for so many vegans. This brand offers a vast array of vegan options, including cream cheese, frozen pizzas, cheese-like wedges/blocks, non-dairy cheese slices, and, what they are most famous for, their cheese shreds (which melt the best of any vegan option out there). You can imagine the ruckus I made when it was revealed that they were dipping their toes into the cheesecake world. I grew up in New York – and New York is in love with its…cheesecake. And who doesn’t appreciate a good cheesecake, right? They are rich, creamy, dense, and “oh-so-bad-for-you-it’s-so-good.” Nothing beats a perfect crust with the perfect, dense, creamy layer of cream cheese goodness baked on top. It is the ultimate comfort dessert. You eat a cheesecake when you just don’t give a flying flip about anything else. You eat cheesecake as a treat. You eat cheesecake and you savor each bite. It has been years since I’ve had a cheesecake. I mean…a real cheesecake. I have made a couple of dairy-free versions of cheesecake…but they haven’t worked out so well. One spilled out of my springform pan, while the other one was the perfect density and tasted good…but it cracked on top…so it wasn’t perfect and pretty. But, hey…I tried. So, leave it to Daiya to swoop in and save the day. So, I figured it would be awhile before these turned up in my area. That’s usually how new products unveiled at Expo West happen. BUT…it was different this time. A few weeks ago, I was in Whole Foods and as I was walking down the frozen food aisle, I glanced over and saw a shelf of all four flavors of the cheezecakes that Daiya has put out on the market. For those wondering, these four flavors are: New York, Strawberry, Key Lime, and Chocolate. I made a few happy noises and my roommate and I vowed to pick up one of the Daiya Cheezecakes the following week, when we could bring a cooler and not leave it in the car while we finished up the rest of our shopping. True to our word, we did return. And after a very short discussion over which flavor we should try first, we unianimously settled on the Daiya New York Cheezecake. Why? Because nothing is better or more versatile than a New York-style cheesecake. Trust me. I know. We purchased the dessert and brought it home, where I put it in the freezer and let it sit while I made some out of town trips and all that good stuff. But, with my running on hold (which, granted, probably isn’t the time to develop a dessert-crust on a high-fat treat) while I am in recovery and physical therapy for a torn hip labrum, I am making my way through some of the things in my pantry, freezer, and fridge. This Sunday, it was all about the cheesecake! Daiya New York Cheezecake is fairly simply to prep for devouring. Simply remove the cheezecake from the package and transfer it to a cutting board or plate, and then place it in the refrigerator. Allow it to thaw for 5-6 hours. Then, slice into it (it says it feeds 4-6 people, for the sake of my waist and my weight, I opted for 6) and transfer it to plates. Thaw these slices for an additional 20 minutes at room temperature before serving and refrigerate any unused pieces immediately. If you don’t have 5-6 hours to kill, you can thaw the unwrapped cheezecake at room temperature for 30 minutes, slice it, and then thaw an additional 45 minutes. You should NOT refreeze this dessert. And, according to the box, it is best if consumed within 48 hours of thawing. So…I did all of the above on Sunday afternoon, allowing the Daiya New York Cheezecake to thaw in the fridge while I went about my crazy Sunday afternoon. After eating dinner that night, I popped into the kitchen and sliced up the dessert, serving up tiny little wedges to both myself and my roommate. Settling in, I was eagerly anticipating my first bite. So…I took it. And fell in love. Seriously. My first thought was that these were going to taste like Daiya. Let’s face it, my vegan and Daiya loving friends…Daiya products have this particular taste about them. But the Daiya New York Cheezecake doesn’t have that. It is light and soft and tastes like a New York Cheesecake. That’s the great thing about a plain cheesecake. You can dress it up if you want with berries or jams or even caramel or chocolate. But I’m a purist. I wanted to taste it on its own so I could draw a good conclusion on how I felt about the taste. And, I was beyond impressed. While it is nowhere near the density and richness of an authentic New York style cheesecake, it was creamy and rich. I actually appreciated that sort of texture because some New York style cheesecakes are a little hard to swallow. This could be, honestly, the most perfect dessert. I also loved that the graham cracker crust is only a tiny, itty-bitty layer on the bottom, because this made the main focus the cheesecake itself. I don’t want a lot of crust. It isn’t the star of the dessert. It’s that creamy topping that everyone wants. And this was smooth and light. And that…was a winner for me. The cheesecake itself is rather small when compared to a regular one, but…I appreciated the size. No over-indulging. Just right. So, let’s talk about what goes into a Daiya New York Cheezecake, shall we? The Cheezecake Filling is made from filtered water, dessicated coconut, evaporated cane sugar, coconut oil, tapioca starch, non-GMO expeller pressed canola and/or non-GMO expeller pressed safflower oil, potato starch, pea protein isolate, vanilla extract, sea salt, vegan natural flavors, vegetable glycerine, sodium alginate, xanthan gum, lactic acid, tricalcium phosphate, cultured sugar, agave syrup, titanium dioxide, and vegan enzyme. The Gluten-Free Crust is made from tapioca starch, coconut oil, evaporated cane sugar, brown rice flour, white whole grain sorghum flour, potato starch, filtered water, non-GMO expeller pressed canola and/or non-GMO expeller pressed safflower oil, blackstrap molasses, vanilla extract, milled flax seed, psyllium, leavening, sea salt, xanthan gum, and sunflower lecithin. Whew. This dream come true dessert is gluten-free, dairy-free, soy-free, cholesterol free, and vegan. So, let’s talk about the nutrition facts of the Daiya New York Cheezecake, shall we? I know it’s a dessert, but it is about half the size of a regular cheesecake…but it will eat like a real cheesecake. I cut my portion down by making 6 servings instead of four, but if you stick to the 4 slices per the box recommendation, you’ll be taking in 16 grams of saturated fat. My thighs are already planning their revenge at the gym today. The fat and sugar contents are both high as well…but…this is a dessert. I get that. SO…with that preface…a serving size is 1 slice (100 grams), with 4 servings per box. One serving will give you 360 calories, 24 grams fat, 16 grams saturated fat, 420 mg sodium, 34 grams carbohydrates, 2 grams fiber, 17 grams sugars, and 3 grams of protein. So, it’s up there on the calories and fat…so remember…it is a treat. Do not overindulge. This was, truly, one of the most amazing, decadent, and fantastic store bought desserts I have had the honor of indulging in since having to give up gluten and dairy. Rich, creamy, and sinfully good. Daiya definitely did an amazing job creating this line of cheesecakes and I look forward to trying the other three flavors. In moderation. And after hitting the gym. This entry was posted in Cake, Cheese, Dessert, Expo, Food, Frozen, Gluten-Free, Products, Review, Snacks, Sweet Stuff, Vegan, Vegetarian by The Celiathlete. Bookmark the permalink. I was going to try this but hesitated. Thanks for taking the plunge! You can read about my cheesecake disaster on my blog. Sirabella’s Vegan Cheesecake is much better. We have what you would get in a bakery when it comes to quality and size. Try us out at http://www.VeganCheesecake.net . We ship nationwide! I would LOVE to try it, but it doesn’t look like they are gluten-free, so I’ll have to stick to Daiya for now.